Earn 123 loyalty points, worth £6.15, with this purchase. With summer just around the corner for many the battle with Sweet itch is a dreaded consequence of finer weather. But now the Horseware Rambo Sweet itch Hoody is here to help! The Rambo Sweet itch Hoody is made from tough 1000 Denier Polyester making it extremely durable yet fully breathable throughout the summer months. 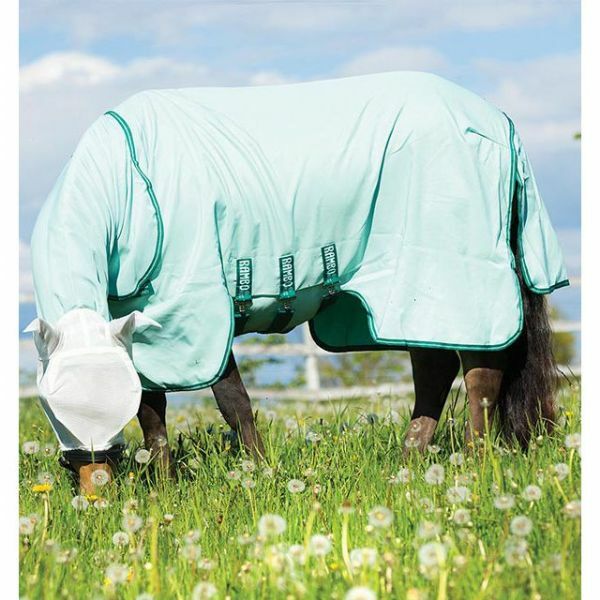 It incorporates a silky mane & shoulder liner to minimise the horse's ability to rub and has extra deep sides and leg arches to allow the rug to wrap around for added coverage. With a fully integrated neck cover and Super Size Tail Flap the Rambo Sweetitch Hoody offers complete head to tail protection from biting insects. Sizes: 5' 6"- 7' 0"